Creative Learning Arts School aims to be the finest daycare and preschool in Bethesda, providing our students with a unique educational environment that fosters growth and development. We are committed to our students’ success, and our Reggio Emilia approach is student-centric, ensuring that your child enjoys a fully rounded and all-encompassing educational experience. To learn more about our Bethesda preschool and daycare, contact us today! Our Bethesda daycare and preschool differs from many others in the area, and one of the reasons why has to do with our foreign language immersion programs. Offering Spanish and Russian language classes, Creative Learning Arts School is able to provide your child with an educational experience that’s unlike any others in the area. 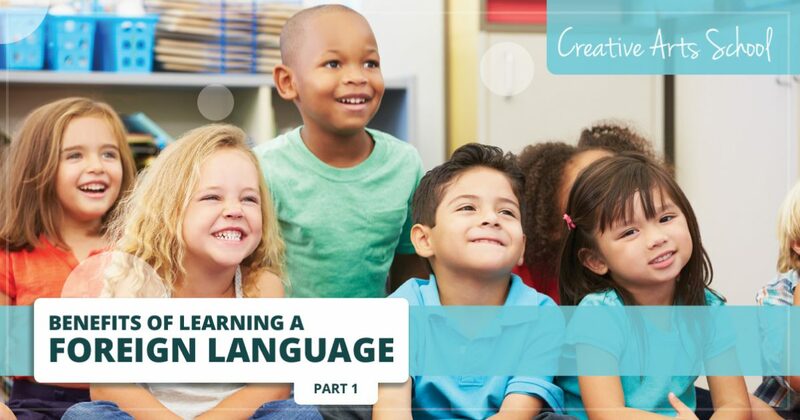 In part one of our blog series, we will look at a few benefits that your child can gain by studying a foreign language. The diversity of our country is something that is more important than it’s ever been. By the time your child reaches adulthood, chances are they will have interacted with a variety of people from an array of different cultures. While having a broadened worldview is one of the many great benefits of studying a foreign language, if your child sticks with the foreign language of their choice, they’ll be able to take things a step further by being able to communicate with people from other cultures. Surely, language barriers are relatively easy to work around, but nothing beats the true connection that comes from having a fluent and lengthy conversation with a person. Language will no longer be an issue with your child being multilingual, and it will allow them to communicate with more people then if they weren’t. Beyond that, they’ll be able to truly connect with more people, as they won’t have any issues in trying to communicate with them. With the diversity of our world only increasing as the years go by, the necessity of being able to communicate and connect with other people is more important than ever. Starting your child off young will give them a head start on this, as well as a level of fluency much sooner than if they were to learn a language later on in life. While trying to learn a language later on in life can come with its own unique set of challenges, doing so for children is considerably easier. Additionally, children who learn a second language have also been known to have improved English skills as well. New skills that improve existing skills? It’s true! The process of learning a foreign language is nearly identical to when your child was first learning English. While observing parents and family members speak played a large role in your child’s ability to learn English, they also learned the basics of it in school. Grammar, sentence structure verb tense and more were all large parts of your child’s initial exposure to the English language, and all of these things are very much a part of their learning a second language. In doing this for a second (or third) time, students can also sharpen their English skills, as they are able to draw connections between the two languages and how they developed their skills in both. Studying a foreign language can help your child improve their skills in a variety of areas related to language, including reading and writing. As your child grows older and enters middle and high school, the chances of them excelling with English studies is considerably higher, as they have will have a better grasp and understanding on the mechanics of language than if they had not studied a foreign language. Those are just two examples of how your child can benefit from learning a foreign language. Our foreign language immersion program at Creative Learning Arts School is a great way to give your child a head start on learning a foreign language, giving them an array of benefits and advantages over students who don’t. We will continue this topic in part two of our blog series, but until then, to learn more about our Bethesda daycare and preschool, contact Creative Learning Arts School today!